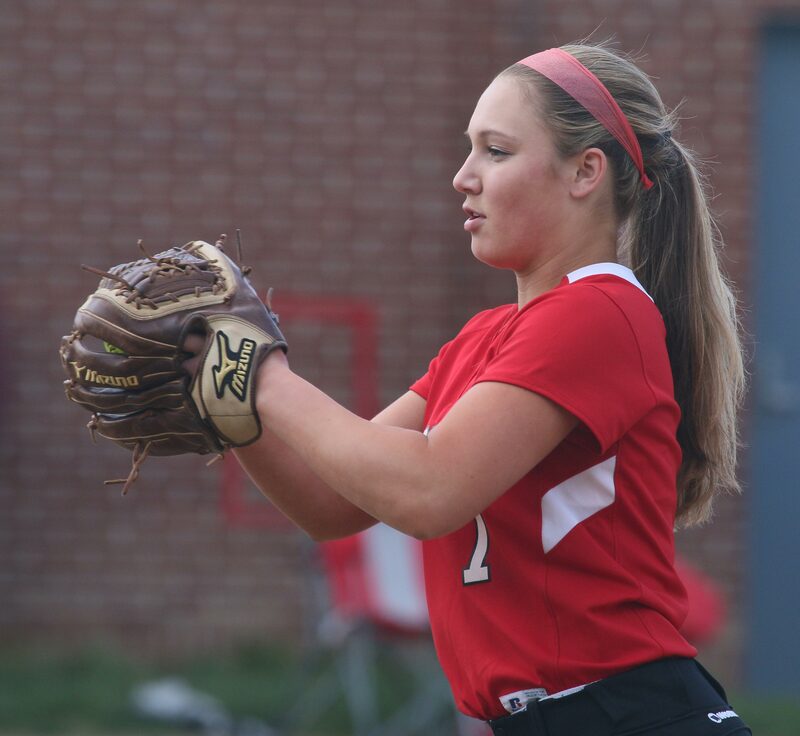 AHS starter Hayley Catania allowed just three hits after the third inning. 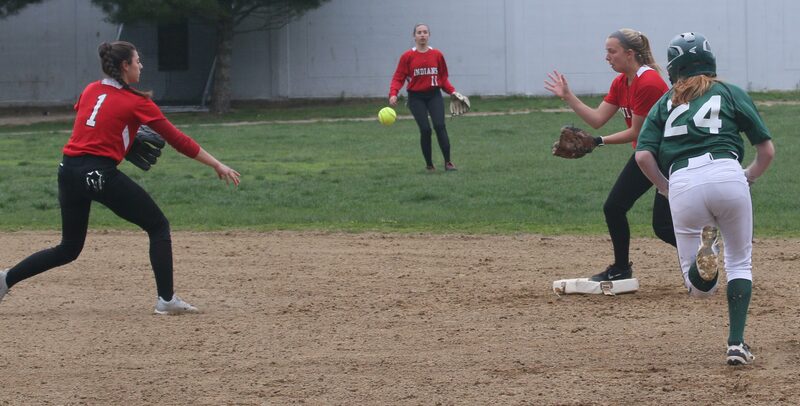 (Amesbury MA) Amesbury (7-2) blew open a close game with a 7-run fourth inning and defeated Pentucket, 13-4, on a chilly Monday afternoon of Cape Ann League softball. 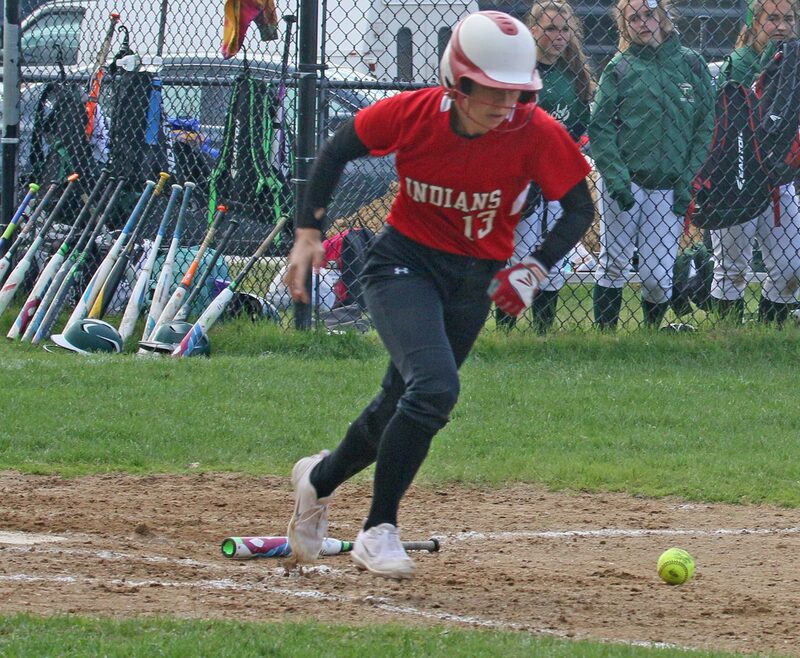 The Indians sent eleven batters to the plate in the deciding 4th and rattled seven hits around Perry Field including home runs by sophomores Kaylie Cloutier and Sage Dodier. This game started as a slugfest with loud outs and hits by both teams. 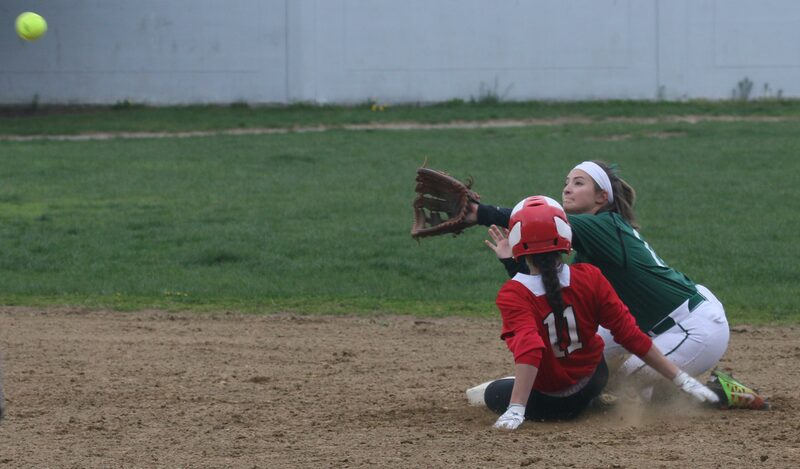 The Sachems (8-4) were ahead 3-1 after 2 ½ innings thanks to an RBI triple by Taylor Fitzpatrick and a home run by Madi Codair. 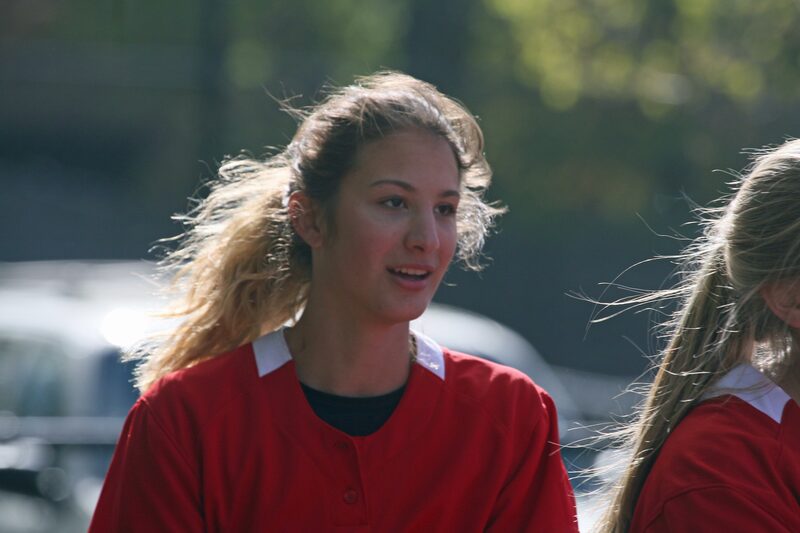 The rest of the way AHS winning pitcher, Hayley Catania, limited the visitors to only three hits and one run. The Indians pushed ahead in their half of the 3rd inning. 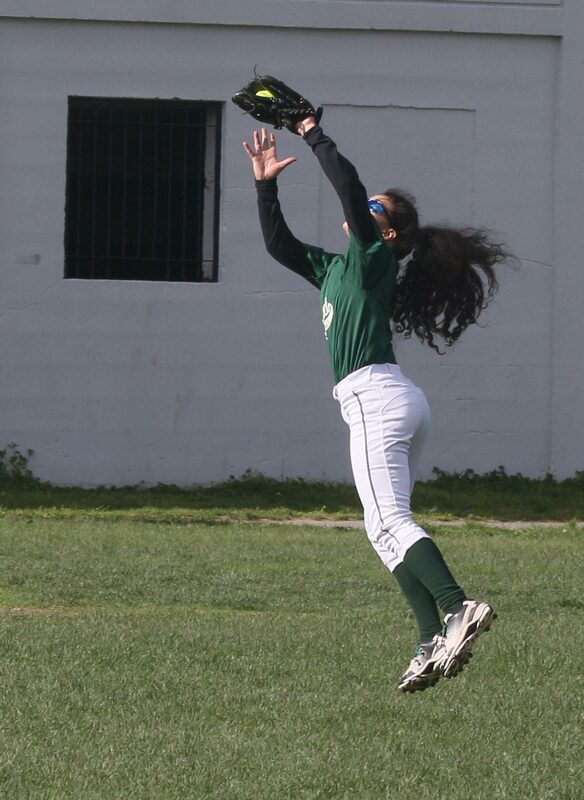 A dropped throw (2B Caitlin Kutcher) in the infield and a ball misplayed in the outfield (LF Mo Quinn) were crucial in allowing the home team to get three runs and take the lead (4-3) for good. Everything went right for the Indians in the game-deciding 4th inning. 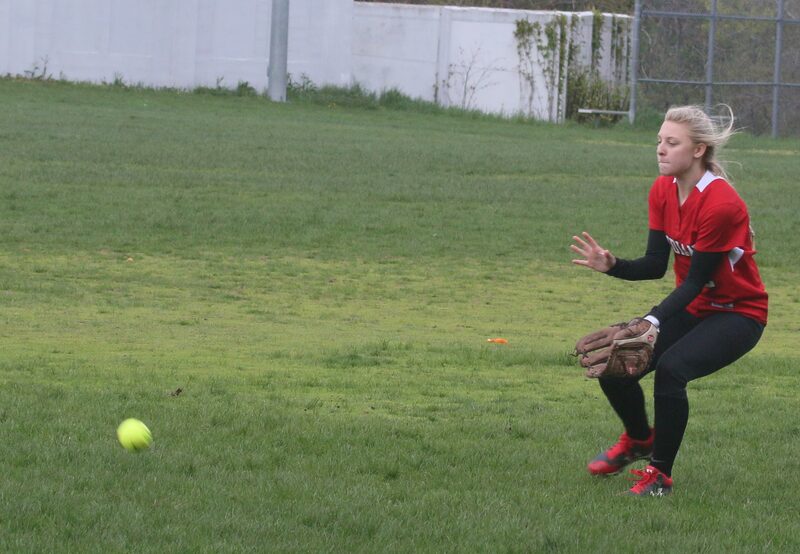 There were solid hits, bloopers, and bunts to clog the bases and big hits (triple Hayley Catania) to clear them. 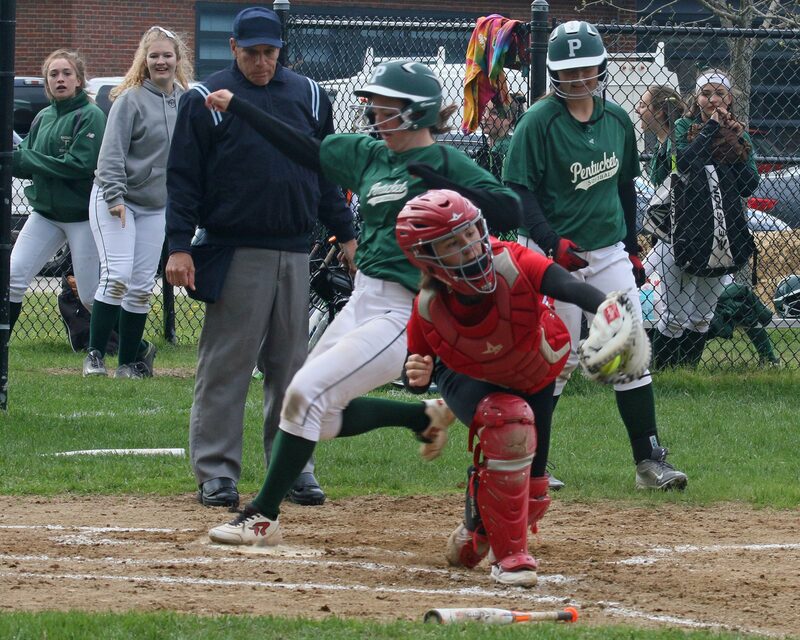 What happened after Mikayla Porcaro drove in the 4th run of the inning was what did in Pentucket. 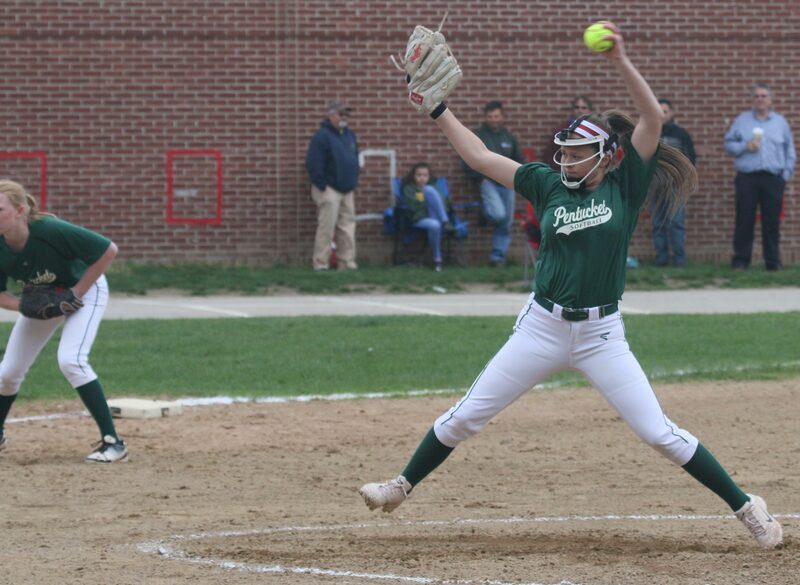 Kaylie Cloutier, who had looked overmatched in striking out the inning before, got into a Julie Freitas fastball and lined it over the head of RF Taylor Fitzpatrick and circled the bases. 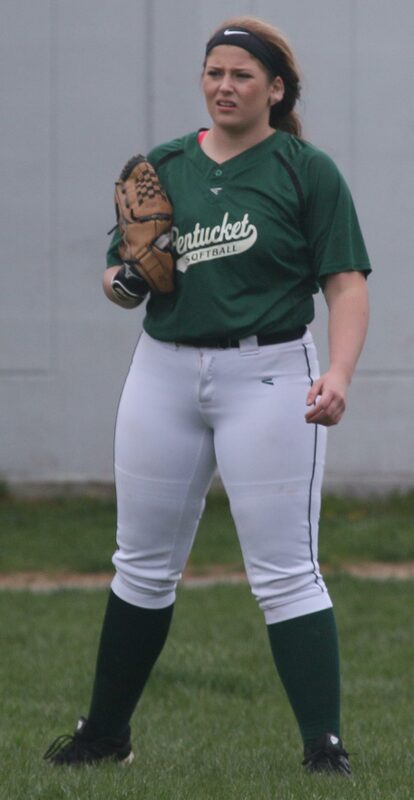 After Abby Aponas walked, Pentucket coach John Walsh brought in junior Mady Gatchell to face pinch-hitter Sage Dodier. 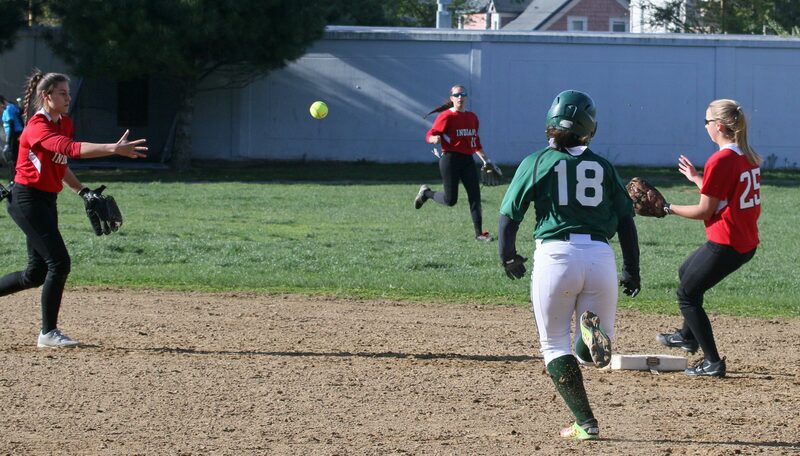 The sophomore matched the Cloutier shot over RF and also ran the bases. 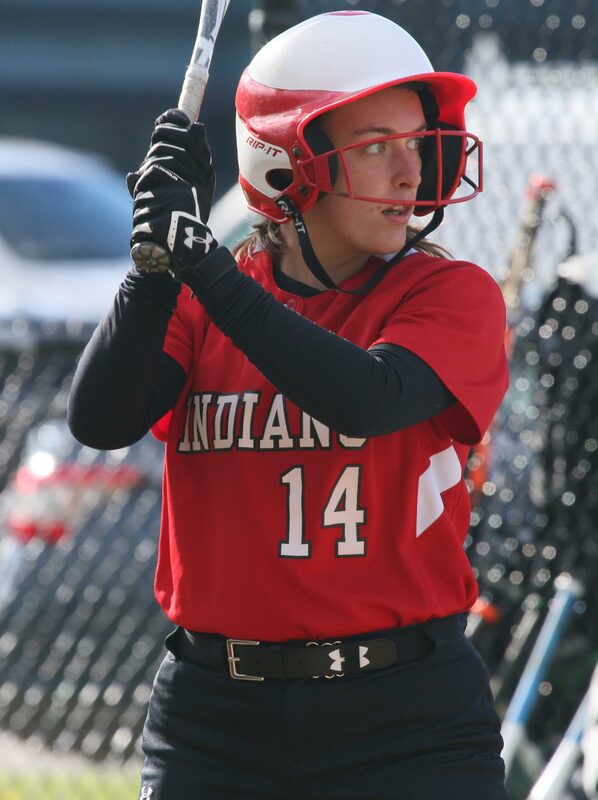 Now in front, 11-3, the Indians had the margin to thwart any comeback plans by the Sachems the rest of the way. 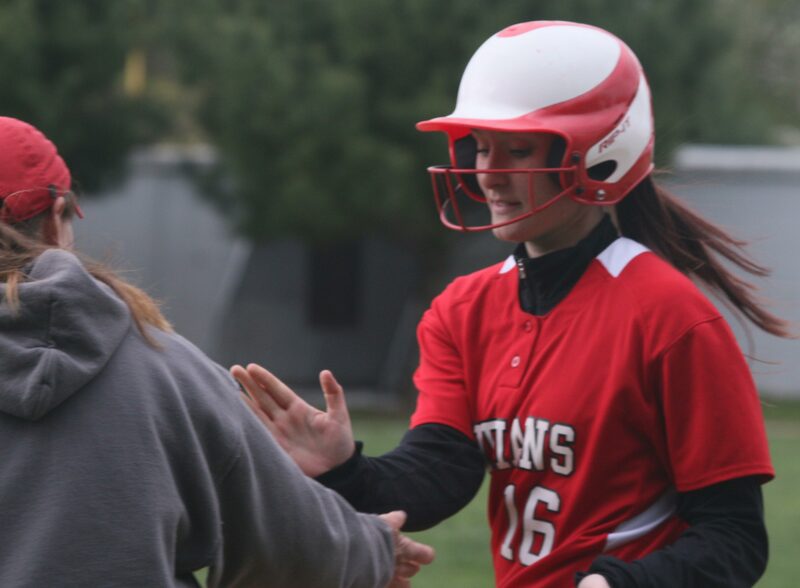 Caity Baker paced the AHS attack with three of their sixteen hits. Maddie Napoli, Emma DiPietro, Hannaih Burdick, Hayley Catania, and Mikayla Porcaro each had two hits. 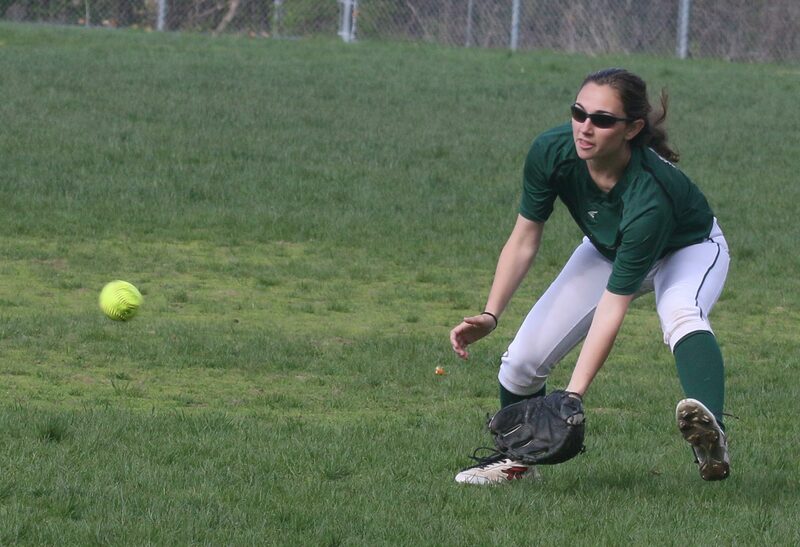 Junior Madi Codair had two hits and two RBI for Pentucket. Busy schedule ahead for both teams as they have three more games this week. Neither team had lost in May coming into this afternoon’s game. 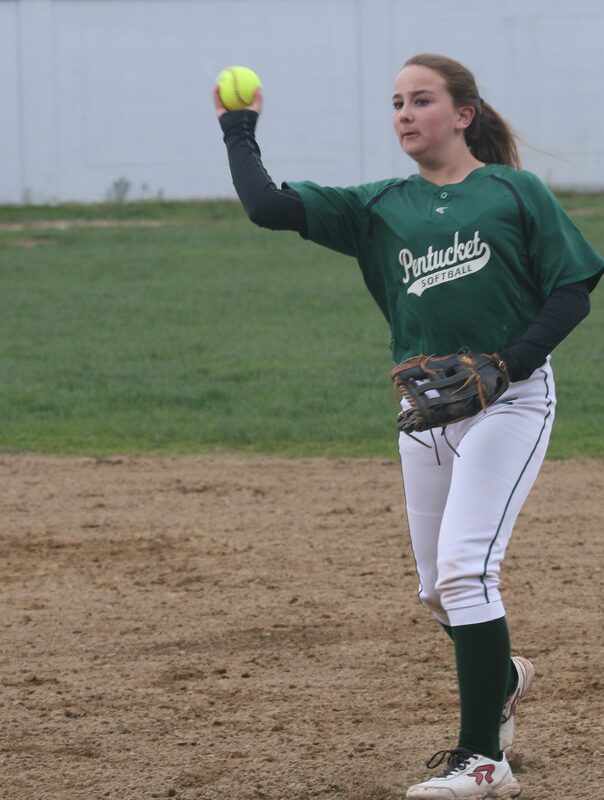 Pentucket had won six straight. Amesbury had now won four in a row. Both teams have losses to North Reading. The temperatures were in the mid-50’s even though the sun was shining. 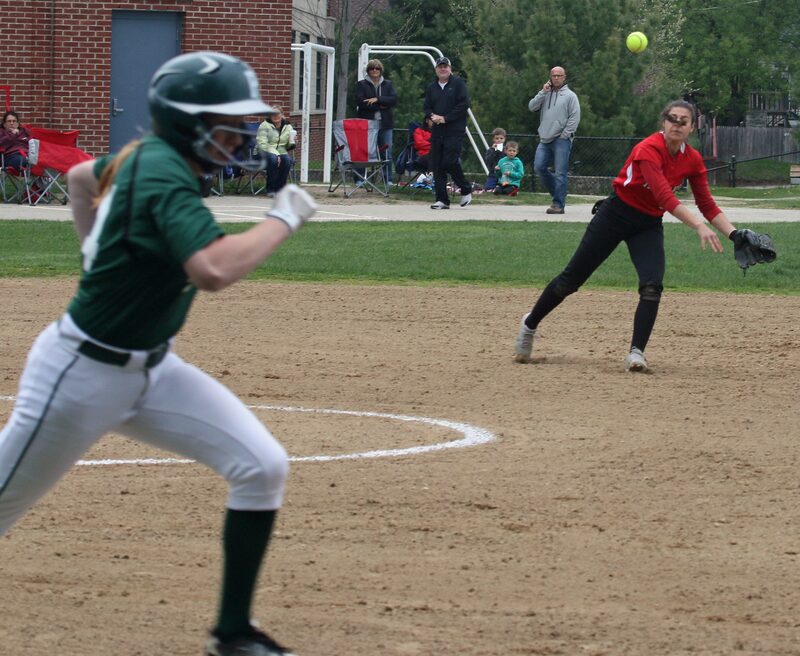 It struck me as odd to have someone named “Autumn” (West) playing third at Amesbury. Brought back memories of Autumn Kligerman. What a senior year she had! Hannaih Burdick (2 hits,2 runs scored) fields a single in right.